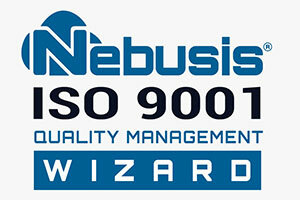 NEBUSIS® ISO 9001 Quality Management Wizard is a dynamic, flexible and agile cloud-based application that provides organizations a simple platform to manage, monitor, document and report results for processes and activities related to quality and customer satisfaction. The solution has each of the ISO 9001:2015 elements, clauses and requirements embedded into its framework; thus allowing users to easily and quickly implement and maintain a Quality Management System based on the standard; thereby expediting quality improvement initiatives and minimizing the possibility of major non-conformities. NEBUSIS® solutions in general will help any organization formally establish, document and/or better integrate and/or disseminate its policies, processes, procedures and objectives, well as and continually evaluate and improvement performance. Facilitates defining the scope of the organization’s quality management system as well as the dissemination and assimilation of quality policies and objectives. Simplifies identifying, recording and monitoring of quality issues by area, process and/or activity in order to better define quality objectives for improving performance and overall effectiveness of measures taken to ensure quality and customer satisfaction. Allows for registering all of the organization’s documents pertaining to quality; ensuring document availability for updating, review, issuance and control in order to comply with the ISO 9001:2015 and regulatory requirements. Easily record quality issues and non-conformities; schedule corrective and preventive Actions (CAPA); track them and visualize real-time CAPA status results. Facilitates the scheduling and execution of QMS management reviews addressing each of the requirements of ISO 9001:2015, in order to drive the continual improvement of the quality management system. Aids Top Management in reviewing QMS related audit results, status of corrective and preventive actions, status of quality objectives, follow-up actions of previous reviews and management system improvement plans. All QMS processes & related information are in one place, thereby increasing effectiveness & efficiency, reducing bureaucracy and information search times. As a cloud-based application users can access and manage their management system from anywhere in the world. Real-time visualization of status of progress towards goals and objectives and goals to be achieved. As a cloud-based it does not require investment for hardware installation or maintenance. Speed and agility in implementing and maintaining your quality management system. Easily go paperless and contributes to protecting of the environment. The ideal tool for your quality and customer satisfaction objectives. NEBUSIS® solutions runs on the Amazon Web Services (AWS) cloud platform which provides our users confidence based on an AWS’s excellent track-record of performance, availability, reliability and security; as their cloud is third-party certified to be in compliance with ISO 9001, ISO 27001, ISO 27018 and a variety of other frameworks. NEBUSIS® solutions can also be deployed on Azure, IBM and Google cloud technologies. Enjoy flexible pay as use, pay as you go, pricing that adjusts to the size of your organization.